As we've mentioned in our training collar discussion with dog trainers earlier this week, not all dogs will abide to traditional training methods. A common solution then that owners and trainers resort to is the use of electric dog collar. Not all of them will be safe and effective, however, so we've tested, reviewed and ranked the best electric collars for dogs in 2019. The use of these devices remains controversial. However, many professional dog trainers (often call themselves “balanced trainers”) disagree that all electronic collars are dangerous and should be banned. Some dogs really cannot be trained without the use of these devices. When used appropriately, and choosing the best electric collars for dogs of highest quality, they're mostly safe and humane for dogs. However, there is no 100% safe collar, no matter the brand. It's the responsibility of the owner to use each electronic collar safely. Pet owners must first educate and train themselves on the proper use of a dog shock collar, its features and safety settings before attempting to train dogs with these devices. Below, you'll find a list of top rated electronic collars that our editorial team have tested, reviewed and ranked – from the most well-known and regarded brands to less popular options lower down the list – a buying guide for these devices, and everything you should know and understand about their safety and effective use for training dogs. Dogtra Fieldmaster (and SportDOG FieldTrainer below) is the most well-regarded and popular training collars for dogs among professional trainers and owners alike. 1900NCP Field Star is one of the more expensive brands, but if you can swallow the pillow of paying $200+ for it, you'll have a device that's reliable, mostly safe and will last. 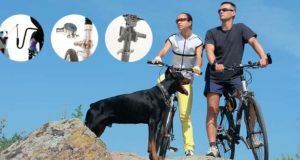 We've tried a number of different devices, but Dogtra's is clearly in the league of its own, and you notice that even before testing it in action – the quality of the collar and transmitter themselves do not feel like a “Made in China” product, which is where a huge number of others are manufactured. This collar is tough, waterproof, has a very clear LCD screen for all the necessary information, different vibration modes and the battery life lasts the longest of all we've tested. The 1900NCP Field Star is Dogtra's most popular e-collar and is truly the star of their product line as well as the whole category of e-collars. Designed for training of home pet dogs, K-9 officers, hunting dogs and other active working dogs where high output stimulation is required, Dogtra Field Master has you covered with low to high power range with extreme accuracy. We, similarly to other people whose reviews I recommend you read, had immediate results with this device. And although we haven't been using the device for long enough to make the claim that other trainers and owners have, I'm positive there will be improvements in behavioral correction directly as a result of using this training collar. Having tested, we still prefer the above mentioned Dogtra device, but SportDOG SD-425 FieldTrainer collar is a close second, particularly because it's much cheaper without sacrificing too much in quality. Standing at 4.5 out of 5 stars on Amazon, SportDog collar has a number of fans among dog owners and the company earned a solid reputation directly through this product. You won't be able to tell difference of a high quality electric collar until you've tried some cheaper brands. If you did, what you'd notice is that Sport Dog collar is a) very easy to operate and use, b) works consistently 100% without hiccups, c) has a separate button for stimulation. SportDOG SD-425 FieldTrainer Remote Dog Training System provides owners with industry-leading technology and most compact system offered for correction or communication of your dog's temperament and learning ability. SportDOG's broad line of other superior products is the result of focusing on a promise made to their customers since day one: to deliver “Gear the way you’d design it.” While we try to not became fans of any particular brand, some companies make it hard to do that when they continue to release quality supplies that easily outshine many others. This shock collar is absolutely perfect for smaller breeds, so if you have a Jack Russell Terrier — you might want to look into this, and not having to spend over $200 for Dogtra's other option. Just like the other two, Dogtra IQ is completely waterproof, has different vibration modes with very precise levels of stimulation and is also very quickly charged (up to 2 hours), and one of the best dog training collars for an affordable price. The new Dogtra IQ Yard Training Collar is a small, yet powerful, electronic training collar for dogs as small as ten pounds. It features a 400-yard range, 2-hour rapid charge batteries, and is 100 percent waterproof so you can train even in the rain. With 3 different types of stimulation–nick, constant, and non-stimulating vibration–and 100 precise stimulation levels, you can customize the training and intensity for your individual dog's needs. The name in itself says a lot — it's pet-safe, and it's elite. Seriously though, if for some reason the above three didn't suit your needs, Petsafe PDT00-13625 Elite will be just as good. Being cheaper and with 15 levels of correction, it's not the most powerful, but it's reliable and it will get the job done for sure. Petsafe PDT00-13625 Elite Big Dog Remote Trainer. Electronic handheld transmitters deliver correction signals to your dog's remote training collar from a distance of up to 1000 yards, effectively placing the key to positive behavior conveniently in the palm of your hand. You'll gain better control and your furry friend will soon learn to obey your commands, giving you both more freedom. And lastly, it's another dog training collar from Petsafe. Reviewed by hundreds of people and standing at 4 stars out of 5, it's our fifth but still very reliable option. At just over $100, Petsafe PDT00-12470 is a rechargeable collar with up to 8 levels of correction. Unfortunately, available for usage in the US only. Fitting comfortably in your hand, the remote allows you to implement a training system that works for you and your dog. She can run and enjoy the freedom of being off-leash, and you can get her attention when you need it. The eight levels of static correction let you adjust with the situation to find the best level for your dog, and increase it if she is really distracted. Last but not least is the option for those who cannot afford any of the top recommended dog training collars over $100. A great dog supplies company Dogwidgets offers you two dog training shock collars, and it's less than $70. While not as powerful or waterproof as those listed above, these Dogwidgets collars do get the job done and are fairly reliable for the price you have to pay. And with 4 stars out of 5 on Amazon and over 800 reviews, people are not wrong about this great dogs product. New dog training shock collar for 2 dogs by DogWidgets. Collars has 2 levels of shocks and 1 level of vibration and has 600 feet range. Collar will work with small, medium and large dogs from 15 to 100 lbs. You can train your dog individually with a shock and vibration or correct your 2 dogs at the same time with a vibration. Use this collar for basic training, jumping on people, chasing cars and barking. Very safe and humane. These type of devicess are sometimes called e-collars, shock collars, remote training collars or electronic collars. These are all the same device. They work to deliver (electric) vibration for training a dog to obey commands or to correct bad behavior. In the past, these collars were so high powered that it became a humane issue among animal activists. Today, improved versions of the device were released by popular and well-regarded brands like Dogtra, SportDOG, Garmin and PetSafe that carry low level shocks that are just as effective in molding and teaching a dog to follow. Shock collars were originally designed to train hunting dogs, and eventually became a mainstream way to deter canine behaviors that are considered to be undesired. “Deter” being the operative word here. If you are considering purchasing a dog shock collar, remember that it is never meant to be a punitive measure. Electric dog collars can be used as a diversion for canines who are being trained not to bark or behave aggressively. If collar training is successful, you should reach a point to where you don’t need to use it within a few weeks. Generally, there is more than one setting on a training collar. They come with a high-pitch warning sound or a beep that lets the pet know they need to change the behavior. If they fail to respond to the warning sound, they will then experience the vibration or shock. Always start with the vibration first, and if necessary move up to the shock setting. The best course of action would be to use it on yourself initially, which might seem scary or extreme, but there is a good reason for it. Attach the collar to your leg or arm, and test out the vibration, increase the setting little by little. Once you’ve reached the point where it is uncomfortable, but not painful, you may then attempt to use it on your pet. If it’s too painful for you, it’s definitely going to be too painful for your dog who is smaller and weighs less than you do. Even if you own a giant breed, there’s no need to go past the setting you’ve used on yourself. It may be a useful training tool, but like anything else shock collars can malfunction too. Since they’re electricity and signal based, these training collars are a somewhat risky option, because like all signals – they can fail. This is why it's crucial to pick the best electric dog collar brand from a well-known company which may be more expensive, but they are least likely to fail and hurt the animal. Most good companies provide fail-safe automatic shut off if the collar starts shock on its own, but this can take up to 12 seconds before anything actually happens. If your pup hasn’t actually done anything wrong, it’s sort of like they’re getting an uncomfortable at best, painful at worst punishment for something that they aren’t aware of. Another thing to take into consideration is that a malfunctioning shock collar can cause more damage that just a simple zap. It’s not uncommon for dogs to be burned, or in extreme situations their heartbeat could be affected by the shock. If your pet has a history of seizures, heart arrhythmia, or any other form of heart disease or defects, you should NOT use a shock collar on your pup at all. As living beings we avoid things that are painful, we are inherently aware of our mortality and do our best to avoid things that cause us pain. Dogs are no different, which is why conditioning and training with a training pet collar generally works well. However, not every pooch has the same pain tolerance – and some dogs choose to simply ignore the vibrations, the shocks and the pain completely. All this information might seem intimidating, but the goal is to promote the safe usage of an electric collar for dogs. When injuries do happen, it less often revolves around malfunction and more around owners not understanding how to properly and safely use a training collar with their pets. In other kinds of dog training, there is usually a swift yank from a leash that is meant to divert a dog from lunging, barking, or growling. This is a difficult thing to maneuver because you aren’t trying to hurt your pet; if they’re pulling against the force of the leash though, it could be painful for both of you. Sometimes our canines are little stronger and more persistent, and dog shock collars could help to reduce these behaviors while minimizing damage to their esophagus and trachea, as well as your wrists and shoulders. If you’re dealing with a particularly stubborn pup, like a younger, unaltered male, they may intentionally pull back on the leash simply because they don’t want to accept you as their leader just yet. With an electric collar, they don’t understand where the resistance is coming from, so they don’t have anything to fight against. It’s highly debated as to whether or not electric fences are an appropriate method of training dogs, but they are often associated with the use of shock collars. This is especially true if a pet zones out after spotting a squirrel or something that they’re able to chase. If you’re using an electric fence as an added training method, you should seriously consider whether or not your pooch is the kind to just keep running. If you have a pet who is deaf, you obviously won’t be able to give them any verbal commands unless they’re looking directly at you. The vibrate setting on a training collar for a deaf animal is an incredibly helpful way to ensure that they are given a clear signal that deters them from whatever negative behavior they may be doing. It’s not painful, and if they’re a good distance away from you, the buzz is a reminder for them to come back. We're about to get further into the buying guide and rest of our best electric dog collars rankings list. If there’s one thing you can trust, it’s an honest opinion of someone who has already tested out the collar and sent in a review. Therefore, even if you choose a device from our list, make sure to read other pet owners' reviews on Amazon or anywhere else you're buying it from. Compare them. Pick several of the listed best training collars and compare what their pros and cons are. Look for unique features, check their safety features and consider purchasing items that include a long-term warranty. All good companies like SportDog, Garmin, Dogtra and PetSafe provide one. Waterproof. One major feature that your electronic collar must have is a waterproof shell. Dogs are notorious for getting into things that they shouldn’t, so you need to prepare for things like rain, sprinklers, pools, accidental spills, or messy water-drinkers. A waterproof collar means that a pet could theoretically go swimming with it on, but this is not recommended. However, a waterproof collar should be safe to wear if you’re at the park and a storm cloud happens to roll through the area. Once you’ve done all your research and you feel that you can confidently handle a dog shock collar, purchase one of the well-rated brands and try it out on yourself first. Make sure to read the instructions manual (all of them include one) and follow the directions exactly to avoid hurting the dog. Remember that because these collars do produce an electric shock, the most important thing is safety. This is a very popular electronic collar due to price-for-value rating that's worth taking a look at if you're not buying any of the above mentioned top rated brands. Pet Resolve's shock collar has extra-long prongs that has no standby mode. You can opt to remove the shock option if you're not comfortable with this feature. It's also possible to train three dogs using just this remote or transmitter but you have to buy the extra collars or receivers separately. The Educator dog training collar is rising in popularity due to its unique features and design. E-Collar's bundle includes a shock collar, a dog training clicker, and The Educator. The latter is a remote-controlled trainer that has unique features and design. It doesn't look like a typical transmitter for shock collars. The devices are all waterproof and can float in the water. The collar may be easily cut or adjusted to size to fit smaller dogs. DogCare's collar has three training modes that will teach the dog to obey, learn basic commands, as well as curb the bad habits. This device does not cause accidental shock since the remote has a security lock pad that prevents mishandling. Unlike other brands, this set is ideal for training 9 dogs all together with just one remote control. Just buy an additional dog shock collar (receiver). This is one of the most affordable pet training collars online. It’s designed with signal stability between the receiver and the transmitter. This works for most dog sizes and the neck's circumference can go from 14 to 23 inches. Petronics offers a five-year warranty for this shock collar. PetTech's dog training collar is popular with professional canine trainers and pet owners alike, and it's a good option for those on a budget. Featured with four training modes, this works to lessen the dog's aggression, barking, wandering and obedience issues. Ideal to use for two dogs, the range of this shock collar can go up to 1,000 feet. The remote has an LCD screen indicator. This electronic dog collar delivers quick results according to many pet owners. PetSpy calls this a premium collar but it's not really and doesn't compare to our top five brands mentioned above. That said, it's a decent option for the price and a good alternative. It has a rechargeable receiver, remote control activation, and auto sleep mode. The collar is made of soft and non-irritating rubber, while remote's design is great for blind operation as the buttons and controls are intuitively laid out. The TBI dog shock collar has an advanced design that's 30% more efficient many than other popular brands, and this is a good price-for-value offer. Its remote range can reach up to 1500 feet. The shock modes on this ecollar also go from level 1 to 100 for a more personalized training and sensitivity adjustment. You can also switch to four training modes: beep (sound), light, vibration, and shock. The Bousnic electronic collar has eight levels of stimulation so that it can be matched to your dog's temperament. It's not the highest number of sensitivity adjustments, but for the price this could be a fairly affordable and decent option. It's great for indoor and outdoor use since this remote has 1,000 feet range. The collars are made of nylon and ABS while the remote has an ergonomic design for easy grip. The Petrainer cheap shock collar is one of the more popular brands on Amazon and for the price is a very affordable device for teaching dogs to obey within a small range (900 feet). It has been manufactured for the typical household on a budget, and the collar/transmitter range is applicable for backyard or park training only. Novice or beginner owners-trainers will find this shock collar easy to operate. The remote can work for two collars. The shock levels on this collar may be adjusted in 16 different levels so you can set the sensitivity according to your dog's temperament after you test it on yourself. This large number of sensitivity levels is a good sign and assures that the dog won't feel any discomfort and pain during the training. The set already comes with two receiver collars that will work on the remote transmitter simultaneously. This is good for up to 1,800 feet. For the price, it's a good option. WDFZONE's remote can transmit to three shock collars, so this would be practical and useful if you'd like to train more than one dog. If you don't have more than one dog, then this one may not be worth it since for the same price you can get a better quality collar for a single pet. The collars themselves are made of soft silicone that won't cause skin damage. It's effective for both long and short haired dogs. Only use an electric collar for dogs that are in training. Take the device off when the training sessions are over and never use the collar along with a leash or a regular dog collar. Shock collars must also never be used on dogs beyond eight hours a day. You should check the dog’s neck every hour during the training. Make sure that this device fits snugly. To test the fit, put one finger in between the dog’s neck and the strap.